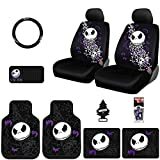 This is a set of latest Nightmare Before Christmas Jack Skellington design bundle set created by Yupbizauto. Bundle set includes 2 low back front seat covers, 2 headrest covers, steering wheel cover, 4 heavy duty rubber floor mats (front and rear) CD Visor, Air Freshener and a Little Tree air freshener. Seat covers made with soft polyester and foam backing for maximum comfort. This Skellington design set will make the look of you vehicle unique and fun. Vinyl steering wheel cover fits wheel from 14.5 inch to 15.5 inch in diameter. Bundle set includes 2 low back front seat covers, 2 headrest covers, steering wheel cover, 4 heavy duty rubber floor mats (front and rear) CD Visor, Air Freshener and a 2oz travel size Purple Slice .